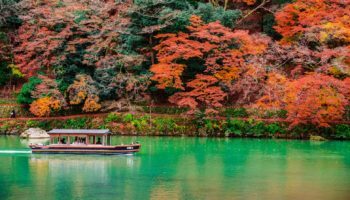 The event is held annually in Arashiyama (not far from Kyoto city center) from July to September and takes place at night on the river. Visitors are taken on boats up and down the stream where they can view up-close how the fishermen use aquatic birds called cormorants to catch fish. 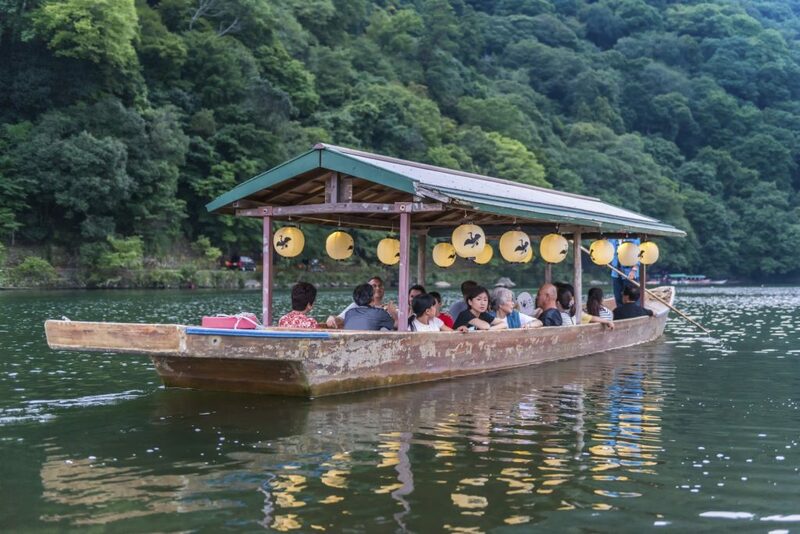 Tourists on a boat used for watching cormorant fishing on the Katsura River in Arashiyama. From the boats, the fishermen have the cormorants reach the water, and, when the bird catches a fish, it is quickly reeled in via a rope tied around its neck. The noose serves the double purpose of making it impossible for the bird to swallow the bigger fish. Once the bird is back on the boat, the fisherman forces it to spit the fish out and then sends it back in the water. 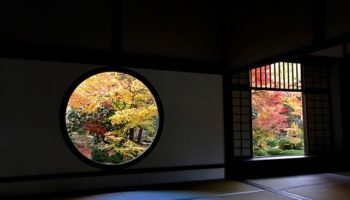 The event represents one of the oldest Japanese ichthyic traditions. 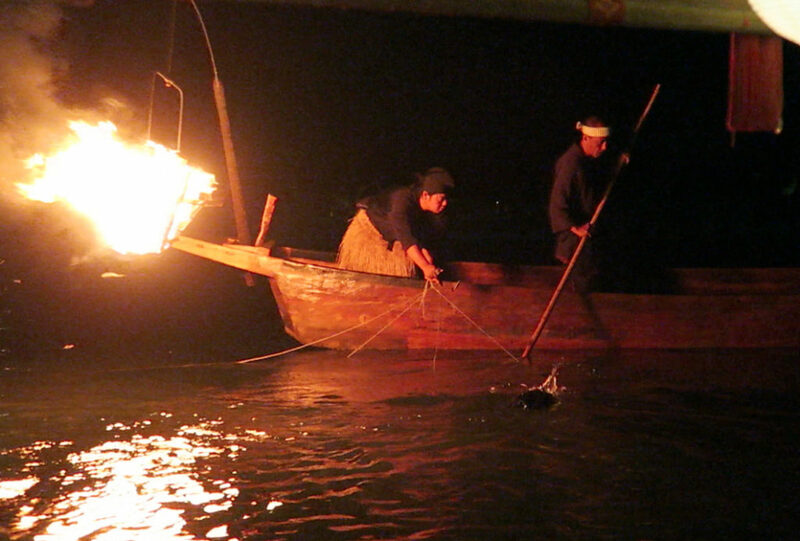 The fishing boats are very simple wooden vessels with a large pyre hanging from their bow. They are manned by two fishermen, dressed in traditional Japanese garments. 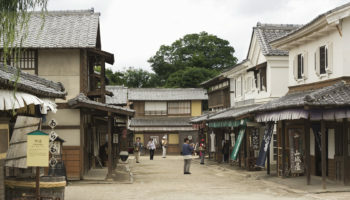 The event represents one of the oldest Japanese ichthyic traditions and is enriched by folkloristic showmanship on the part of the fishermen who loudly cheer the birds, as well as engage the visitors, who, often join in. Photo by: Lucio Maurizi Ukai on a summer night in Arashiyama. The whole experience is unique and easily enjoyable. The atmosphere, with the burning fires in the distance and the dim city lights around the river to accompany you, is surreal and romantic. Restaurant-boats will serve the customers and it is not rare to see parties with the traditional maiko (an apprentice of a “geiko,” similar to a geisha) performing on other boats. The event is held from July 1 to mid September every night except Aug. 16, from 7 p.m. to 9 p.m. The tickets are ¥1,800 for adults (¥2,100 yen if you book a special boat ahead of time). Take the Keifuku Arashiyama Honsen Line to Arashiyama Station, and then walk 10 min. 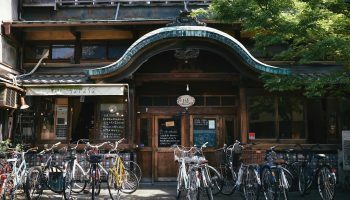 Take the Hankyu Arashiyama Line to Hankyu Arashiyama Station, and then walk 15 min. Take the JR Sagano Line to Saga-Arashiyama Station, and then walk 15 min. 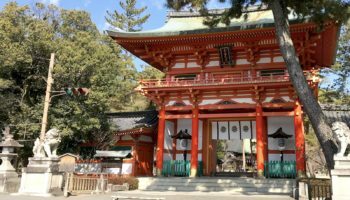 Take the Kyoto city bus #28 to Arashiyama Koen.